Having only just set up shop, Bakers & Co were opting for a soft launch of their new, San Francisco-inspired venture this weekend. The Gloucester Road contingent clearly had other ideas. Thankfully we’d set the alarm for this one, breezing in by 9am to find only a few bleary-eyed parents perusing the freshly printed menus. By 10 there was a small queue forming at the bar and out the door, such has the buzz been about this latest addition from the folks behind the hugely popular Bravas on Cotham Hill. The place is pure California, with sunshine-yellow awning, stripped wood and shining chrome contrasting Mexican ceramics in the kitchen, the central point to the neat space. Little picnic benches and a handful of stools along the bar accommodate a surprising number of covers, with just enough room in between to fit the regular traffic of buggies that will no doubt be seen here: offspring are catered for with their own portions and there’s an early morning small bites menu served from 8am to fuel those who have forgotten what the words ‘lie-in’ ever meant. Making the most of our early start, we opted for salted chocolate and hazelnuts on sourdough and a pot of delicious blueberry yoghurt and pomegranate to go along with excellent coffee and freshly squeezed fruit juices. Chefs quietly prepped around us as we ate, great handfuls of coriander, avocados and limes being carried to and fro and a tower of freshly made maple buns appearing on the bar as if by magic. Later, the main menu proved even trickier to choose from with an eclectic selection ranging from huevos rancheros to the full Baker’s breakfast. 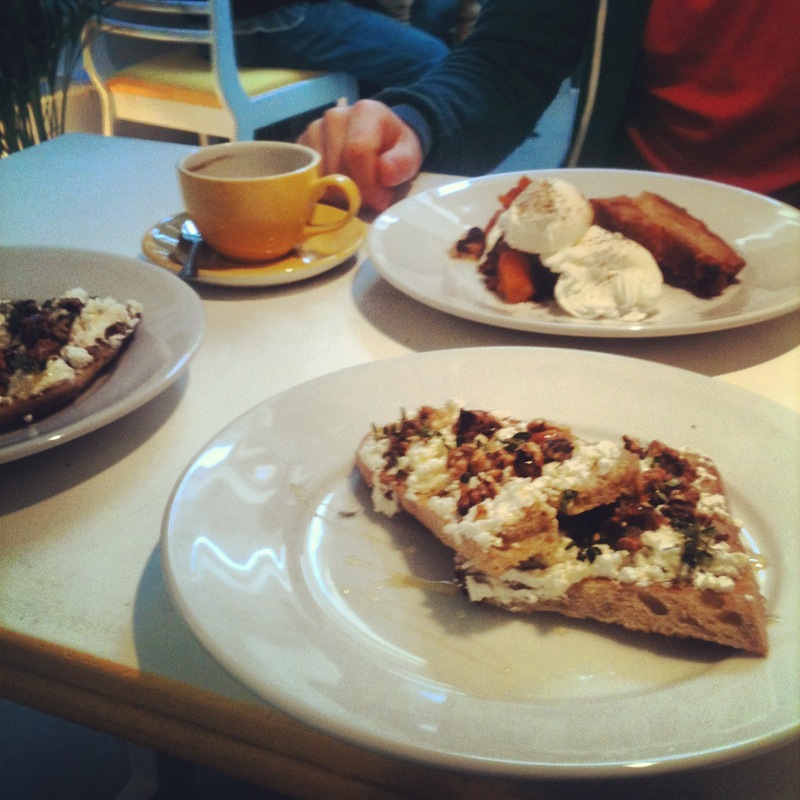 The Egg Poacher went all out with pork belly, sweet potato bubble and squeak and (naturally) poached eggs, while I opted for the lighter but equally delicious goats cheese, honey and thyme on toast. The flavours pop and everything’s beautifully made, with a nod to their suppliers on the menu reinforcing the idea that everything has been carefully considered here. 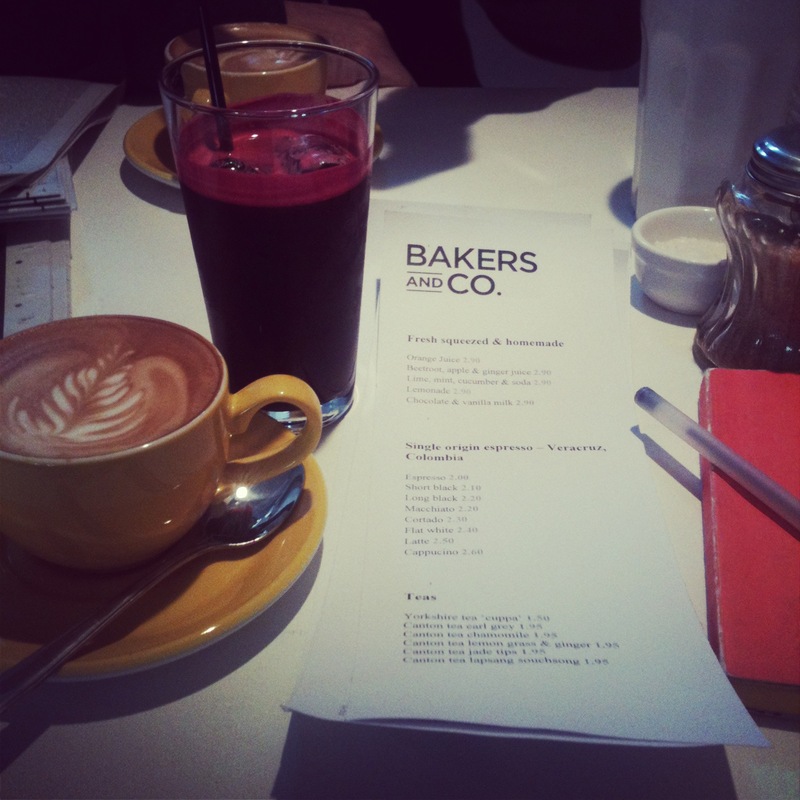 Bakers & Co should get used to being this busy – with food this good, it’s destined to become a Gloucester Road favourite. Lucky, then, that they’re also blessed with a lovely staff to manage the hungry hoards (even the chefs got stuck in to clearing tables with a smile). My advice? Get there early. This is soon to become the hottest brunch ticket in town. Price: from £3.50 (starters menu) to £9.95 (Baker’s breakfast).